William Branham told a story of how he prophesied that the Ohio River would flood Jeffersonville and New Albany, Indiana, and that the water would rise 22 feet over Spring Street. Jeffersonville, Indiana - Citizens Trust Co. Water crest at 23 feet. 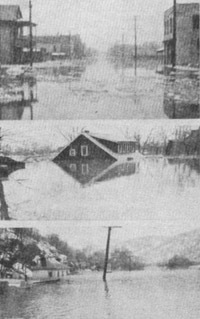 The flood took place in January and early February of 1937, with damage stretching from Pittsburgh to Cairo, Illinois. One million people were left homeless, with 385 dead and property losses reaching $500 million ($8 billion in 2012 dollars). The first time that William Branham mentioned this prophecy was on July 17, 1951 many years after the flood took place. There is no independent evidence that he prophesied this flood in advance of it happening. It is interesting that he mentions the 1937 Ohio River flood on several occasions in 1950 and 1951 prior to his claiming to have predicted the flood. Given the import of this so-called prediction, we find this failure to mention the prophecy quite telling. Peter M. Duyzer, the author of a biography on William Branham, contacted Mr. Warren Schimpff, the owner of the store whose “red-hots,” or candies, William Branham bought in his day, and asked him to measure the water mark on his building. When asked, Mr. Schimpff graciously consented to personally measure the still-existing water marks on his building. 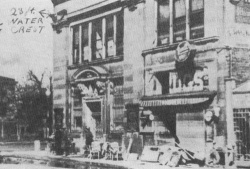 He said, “[T]he water went to the middle of the 2nd story windows & as best as I could measure with a long tape measure, the 1937 high water mark was 222 or 223 inches above the sidewalk [Approx 18’- 6”- PMD]. William Branham stated it was “Thus saith the Lord, 22 feet to the inch, exactly.” How could the Lord be off in his measurements by 3’-6” or almost 20%? It should be mentioned that Spring Street likely rises in elevation, so there may be one point where the flood reached 18 feet, another where it reached 22, and another where it reached 23 feet. However, to claim that it reached 22 feet exactly is a bold prophecy that is likely off by inches or feet. And now, after a bit, It... When I got converted, It got more than ever. It predicted the 1937 flood, when hundreds of men stood there, and laughed, and turned their heads; and I predicted twenty-two feet of water over the streets. Why, I stood there and seen it in a vision. They said, "The boy's gone crazy." 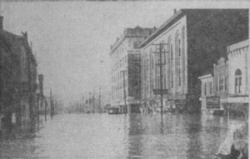 And just a few weeks after that, twenty-two feet of water went over the Spring Street in Jeffersonville, Indiana. See? I seen the '37 flood coming. I remember, I stood right on Fall's City Transfer Company; many you all acquainted with Jeffersonville, knows where that's at. I stood there and was preaching. I'd become a minister then. Many other things happened along the line, oh, it's numerous. How It would tell me to watch at a certain place, do a certain thing. Predicting that flood would come, I said, "I seen them measure twenty-two feet over Spring Street down here." Old Brother Jim Wisehart and them laughed at me. You remember that, Brother George? He said, "Oh, Billy, in '84 it only was about six inches on Spring Street." I said, "I seen a man come down from the skies, and take a measure stick, and stick it there on Spring Street, said twenty-two feet." He said, "You're just excited." I said, "I'm not excited. It's THUS SAITH THE LORD." Ask them how many feet was over Spring Street: twenty-two feet to the inch. Exactly. And that old Bible where I had been preaching on that night... She started raining, the floods breaking through and so forth, and this old church... The seats went right straight up to the ceiling, the Bible went right straight up to the ceiling, washing through here with all that water raising it up. The pulpit went right straight up. They come right down; and every seat set right back in the same place, and the Bible laid right back in the same place, and all that water, and still opened up, the same chapter at the same place. "Heavens and earth will pass away, but My Word shall never pass away." This page was last edited on 29 December 2015, at 02:34.